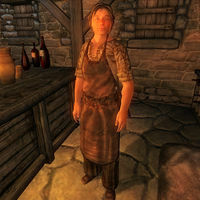 Andreas Draconis is an Imperial publican who sells food and rents beds at The Drunken Dragon Inn. His mother Perennia states that "Andy", as she calls him, has always been interested in beer brewing, and that the opening of the Inn was the happiest day of his life. As a member of the Draconis family, he is involved with the Dark Brotherhood quest line. His only customer at the Inn is an Imperial Legion Soldier, so not much happens in Andreas' life. He offers his services all day long except when he sleeps on the bedroll behind the counter between 2am and 6am. He wears a blacksmith's apron, a pair of coarse linens, and rough leather shoes. He carries a steel dagger as well as a small amount of gold. If you approach him about a bed for the night, he will respond: "Sure, friend, I've got a bed you can rent. It's upstairs at the end of the hall, last door on your right. Just 20 Gold. Sound good?" If you decline his offer, he will say: "All right, but you're missing out. It's a fine room, and to be honest, you look like you could use some rest." If you accept his offer he will once again point you towards the room: "Very good! Your room is waiting. Upstairs, last door on the right. Thanks again, and have a wonderful stay!" Ask him about a room again will net you: "Did you find the room? Remember, upstairs at the end of the hallway. Last room on your right." If you try and rent a room with no gold in your pockets, he will get annoyed: "Look, friend, I'm not running a flophouse here. No gold, no room. No exceptions." He might sound service minded, but if his disposition towards you is below 50 he will close the conversation with an insult: "Next time, go someplace else, huh? The Inn of Ill Omen, the Tiber Septim Hotel... Anywhere but here, okay?" If he likes you, he will close the conversation with "You take care now, buddy." His disposition also affects his first impression, where he will look at you and say: "Hey there, pal! Need a room?" or "Oh, by the Nine Divines, why do I get all the riff-raff?" When you greet him during Next of Kin, Andreas will ask you: "Looking for a room?" You can either tell him you're here to kill him, upon which he fearlessly replies: "Kill me? What is this? Who are you? I don't know who sent you, but you won't take me down without a fight! So go ahead, make your move! ", or you could heartlessly say his mother bled like a pig, and he'll cry: "My mother? No! What have you done to her! I'll kill you! Agghh! ", after which he will attack. You could also say nothing as usual, after which he'll admit: "Hmm. All right, then. You're not one for talking. I can respect that. Well, if you need anything, you just let me know." Esta página foi modificada pela última vez à(s) 18h17min de 3 de abril de 2015.